Renny's Recipes: Seven Recipes to Make your Valentine's Day Delicious! This Post contains affiliate links. We will be compensated for anything you purchase through those links at no additional cost to you. All views expressed are my own. Thank you for your support! Valentine's day is coming up and you might still be wondering what you should be cooking that night. Whether you're planning on a romantic dinner for two, or something fast and easy for the whole family, we are here to help. This blog is full of recipes and I've lined up a few of my favorites here for you to choose from. Remember, you can also go to our Etsy shop and buy our bloggilicious baking pages to create your own hard copy cookbook with our recipes! Our valentine's day will be different this year. It is PH's birthday, so of course we'll be celebrating that! But now we have a little one, and family will be in town to celebrate her because on the 18th she will be blessed at our church. (I guess a blessing is sort of like a christening, but there is no water. Is there water at a christening? I think so. a blessing is when the father, or another worthy priesthood holder, holds the baby and gives her a name and then blesses her with whatever Heavenly Father tells him to bless her with. In a nutshell.) Alicia will be here and her son's birthday is the 13th and he'll be turning 3! Our nephew Hunter is also here and he'll be 3 on the 20th! So with all this busy family time, we'll probably want to be using some of these great recipes ourselves! 1. Strawberry Hot Cocoa Bombs: my mom came up with this flavor last year and we made this cute video to show you how they work! Here in AZ its already 80 degrees, but in those parts of the country where it is still freezing you can warm up with that special someone with these tasty bombs! 2. Salted Caramel Hot Cocoa Bombs: my mom also showed you another fun flavor and decorated them for Valentine's day! Check out how cute they are! 3. Shrimp Pesto with Zoodles: don't forget, last year I gave you the perfect Valentine's day meal. It's what PH and I had, and we enjoyed it quite a bit! I think I might go buy zucchini and make it again! 4. German Rinderrouladen and Potato Dumplings: Go international with this tasty meal from Alicia's journey into German foods! 5. Valentine's Day appetizers: if you're throwing any kind of party (like we are) these Valentine appetizers are sure to be a hit! 6. Swiss Cake Roll: what Valentine's Meal is complete without dessert? Check out our tasty Swiss Cake roll for yours! 7. Butterscotch Not so Squares: Of course Valentine's Day involves candies and chocolate. 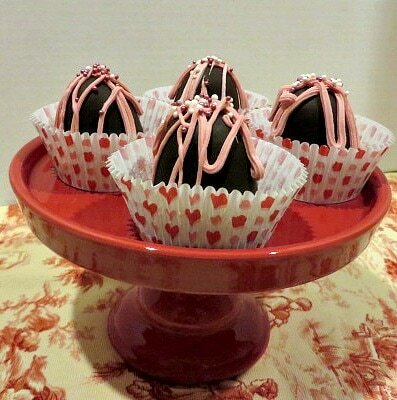 Give a heartfelt gift by making these tasty chocolates that your significant other will love! Well, there you have it. Seven recipes sure to make your Valentine's day a success, no matter whom you're celebrating it with! Whoot! We've made it to Friday Faves #50! And, since Thursday the first of February was National Candy Making Day, what a great way to celebrate our faves! Do you enjoy making homemade candies? We've shared a few of our favorite candy recipes in the past, but we will also be sharing a new favorite this week as well. These homemade candy choices will be perfect this time of year as it gets closer to Valentine's Day! You could even make your own little candy box for that special someone. What are your favorite homemade candies? You are going to notice that there is a theme among us here at 3 Winks. Chocolate! I thought about giving a Divinity recipe, but let's get real. It really is all about the chocolate. Since Lindsey just had a baby and is trying to eat a little more healthy, she chose Chocolate Dipped Strawberries. I don't know if you can really call those candy, but I guess so, because of the chocolate. If you click on the picture, it will take you to our post about healthier dipped chocolates. But, Maddy, with her usually healthy vegan ways said, "Nope! If I am going for dipped chocolate, it is going to be the delicious fondant centers you make, Mom." (She didn't really say that, but I am sure that is what she was thinking as she picked these dipped chocolates.) If you click the picture, it will take you to the Spring version of these delectable treats. Alicia's choice is a little healthier, made with a high protein peanut butter powder. She chose our version of Peanut Butter Cups! They are also lower fat than the usual recipe. Click the photo to go to that post. My first choice was our family favorite Florida Fudge. It is another chocolate-peanut butter delight. You can find the recipe, if you missed it, when you click this picture. Butterscotch Not-So-Squares! These are an attempt at a copy cat of the delicious See's Candy recipe that is so wonderful. I found different recipes for this candy on Pinterest, but adapted it to my own taste. It is pretty darn good, but my family thinks it is closer to a toffee taste rather than the Butterscotch Square taste. But, they gobbled it down and found it to be good, so I will call it a success anyway! Here is the candy center after it is cooled. The parchment paper makes it easy to remove to cut. When you cut it, it may break into less than uniform shapes. Thus the Not-So-Square concept. Dip them, sprinkle them and eat them! Super good! All of these recipes are super easy to make and would be perfect to share! Do you have candy recipes you love to make? Be sure to let us know about them!